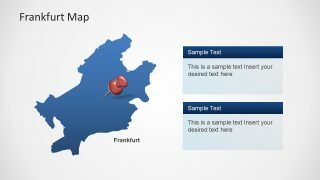 The blue theme Frankfurt am Main PowerPoint Template is a new city map for geographic and demographics presentations. 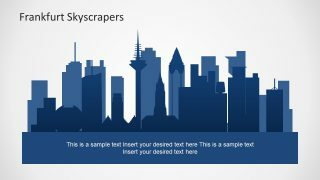 The creative template has silhouette display of Frankfurt’s skyline for day or night life view. 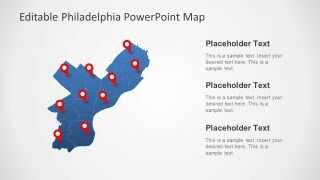 The PowerPoint of fully editable and scalable world’s city map is a flat vector design template. It contains the illustration of major buildings and outline maps. The Frankfurt am Main is one of the biggest city and center of international trade. The silhouette slides of Frankfurt’s skyline present one of major view attractions. 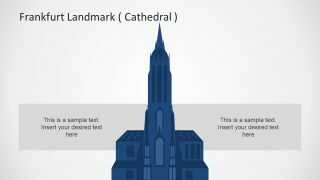 Whereas, the Cathedral silhouette template display the illustration of beautiful gothic church of Germany. 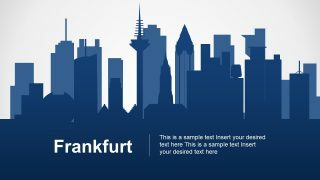 The Frankfurt am Main PowerPoint Template presents the Germany’s metropolitan city with population over 4 million people. The city with one of world’s largest airport, landscape and tourism spots is heart of Germany. 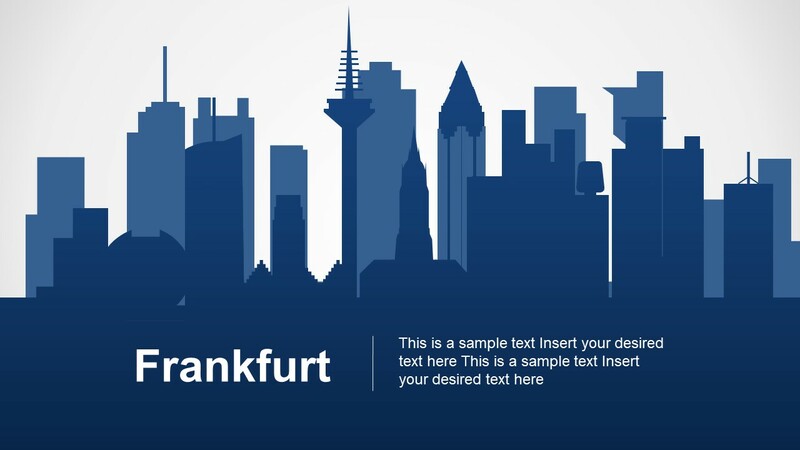 The presentation slides of Frankfurt am Main high-resolution image of city’s map. 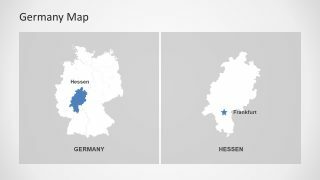 It also contains country map of Germany with location markers over Frankfurt and Hessen. 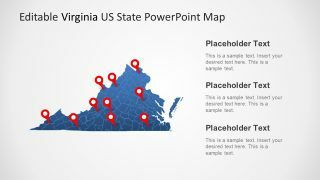 These are layer structure slides of PowerPoint shapes which results in an impressive presentation. Users can modify these layers to change the overall template design such as color theme. For example, select the sections of church and alter their colors and make it more unique image. 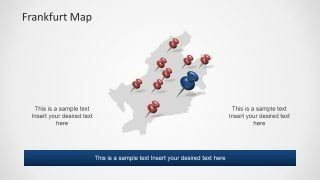 Similarly, modify, add or delete any text, clipart or layout. Moreover, alter the colors and image effects to highlight specific points. 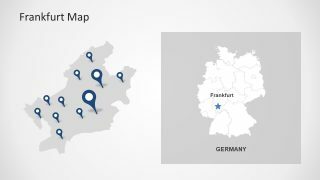 The maps in Frankfurt template have several designs showing pin pointers, location markers and distinct colors. 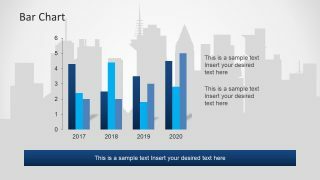 This template of Frankfurt am Main also contains a data driven multiple bar chart of PowerPoint. 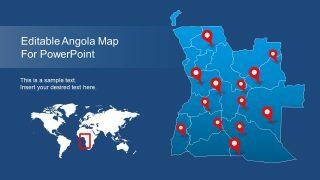 Further, this chart can assist users to demonstrate demographic, financial and marketing statistics of business and more. To edit this creative chart, choose the options plus, brush or funnel shape filter icons each for specific purpose. 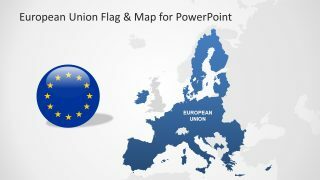 The SlideModel maps gallery also has an 8-slide useful PowerPoint of Germany map.